I had planned on posting this last week for Meatless Monday but decided last minute to post something else. Only to realize Monday afternoon that last Tuesday was National Taco Day, and on Taco Tuesday. Really?!? Don’t worry this is still so good I’m excited to share it with you today! Thank you for joining my co-host Deborah and me for Meatless Monday. One of my favorite dinners, the taco bowl, gets a fall makeover! 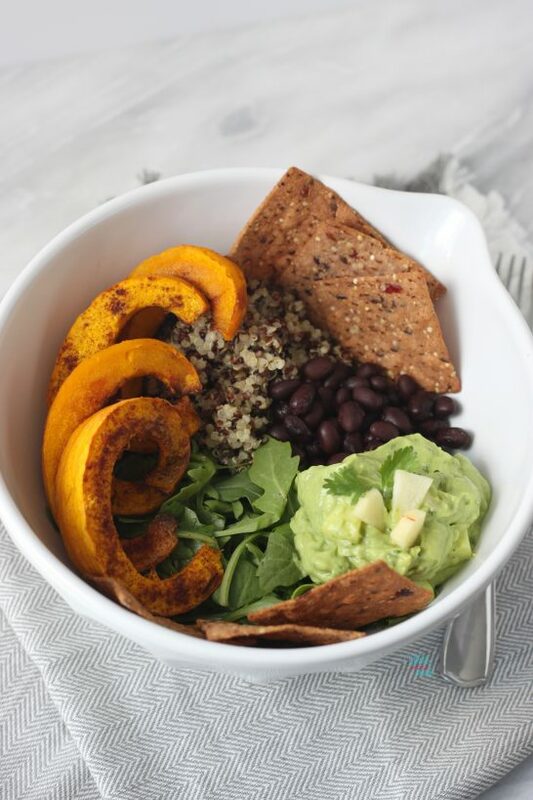 Yep roasted pumpkin, arugula, quinoa, black beans, and… Apple Guacamole! Yes guacamole gets upgraded for fall too. I just couldn’t help it I also had to add some of my favorite Pumpkin Cranberry Sprouted Tortilla Chips since their back at Whole Foods! Spicy Chickpeas also make a great topping for crunch. Seriously I could probably stop writing right now because I don’t have much to say other than it’s DELICIOUS! I wish I could just share a bite because I know you would love it as much as I do. I’ve been waiting for October to roll around before posting it. I was actually planning on posting it last week and forgot, until Tuesday. ALMOST posted it Tuesday because TACO TUESDAY but decided to hold out for Meatless Monday as I didn’t want to rush my words or thoughts, yet I’m speechless. Not because I’m eating it right now either because that would be a totally acceptable reason. I often find recipes I’m most excited to share are the ones that leave me tongue tied. I’m so excited and have all these thoughts but just can’t get them down. In which case I hope that I took photos good enough to do the speaking for me. Of course if that doesn’t happen than it’s just like being a restaurant. You know you open up the menu and you have to decide what to eat based on a few words. Yes some menus do have a couple photos but only a few. You read through the list and pick something. How many times have you ordered something that says one thing but wait you had no clue that was mashed squash, fried pecan crusted cheese on your salad (this one got me once years ago) instead of pecans and goat cheese, or it had something else that wasn’t listed that might be good or bad. Well luckily I have photos, if they turn out as well as I hope or not. 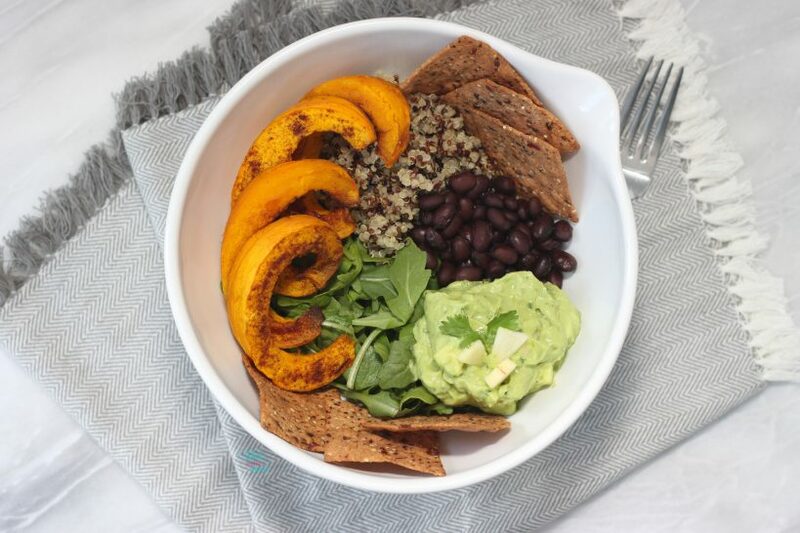 Bed of fresh arugula and quinoa topped with black beans, sweet and spicy roasted pumpkin, sprouted pumpkin cranberry tortilla chips, and chunky apple guacamole. Preheat oven to 350F. Line a baking sheet, or two if doing slices, with foil and spray with coconut oil spray and set aside. Slice pumpkin in half horizontally from the steam down. Scrap out seeds and insides of your pumpkin. Using a vegetable peeler carefully remove the skin from your pumpkin, it may take two passes. Repeat with other pumpkin halve. Cut pumpkin halves into slices or cubes. Spread pumpkin out on prepared baking sheet. Mix sea salt, pumpkin pie spice, and cayenne together in a small dish and sprinkle over pumpkin. Roast pumpkin for 20-30 minutes, it will depend on if you’re cubing or roasting slices and how big you make them. If making cubes I also toss/flip them after 10-12 minutes when checking them. Start your quinoa, cooking according to package instructions. While your pumpkin is roasting and quinoa is cooking rinse and drain your blacked beans and make the Apple Guacamole. Peel and chop your apple if you haven’t already done so and toss with the lemon juice. If you are using a small food processor you can rough chop your cilantro. If making by hand you will want to finely chop it. Cut your avocados in half and remove pits. Scoop avocado into your mini food processor, add in cilantro, salt, and apple cider vinegar. Blend until just blended. If making by hand mash your avocado and stir in apple cider vinegar, cilantro, and salt. Fold in chopped apples with the lemon juice, no need to drain. If you make it in a food processor put the guacamole into a bowl and fold in chopped apples. Assemble taco bowls with arugula, quinoa, blacked beans, and roasted pumpkin. Top with Avocado Guacamole, chips, chickpeas, or any additional toppings as desired. Enjoy! The taco bowl gets an update for fall with roasted pumpkin, apple guacamole, and sprouted Cranberry Pumpkin Tortilla Chips! Gluten free, vegan, soy free. 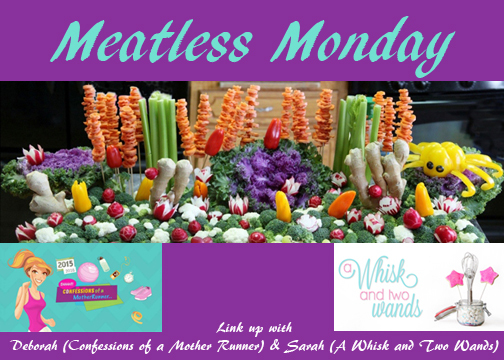 Spreading the Meatless Monday love I’m also linking up with Running on Happy and The Fit Foodie Mama for their Meatless Monday! They all come together so well and the apple guac is pretty darn amazing if I do say so. Pair it with the Sprouted Pumpkin Cranberry Tortilla Chips and I will eat it every day! I never thought about making a pumpkin taco bowl! How creative! Thank you Annmarie! Any way to get my veggie bowl and taco fix I’m there! I love the Fall make-over, but that guac must be the best! Love the apple! Apple quacomole? Taco bowls? YES! This looks and sounds amazing. Pinned! Thanks for hosting. YES, it’s real and really good! Thank you for sharing and joining us! I would definitely order this. 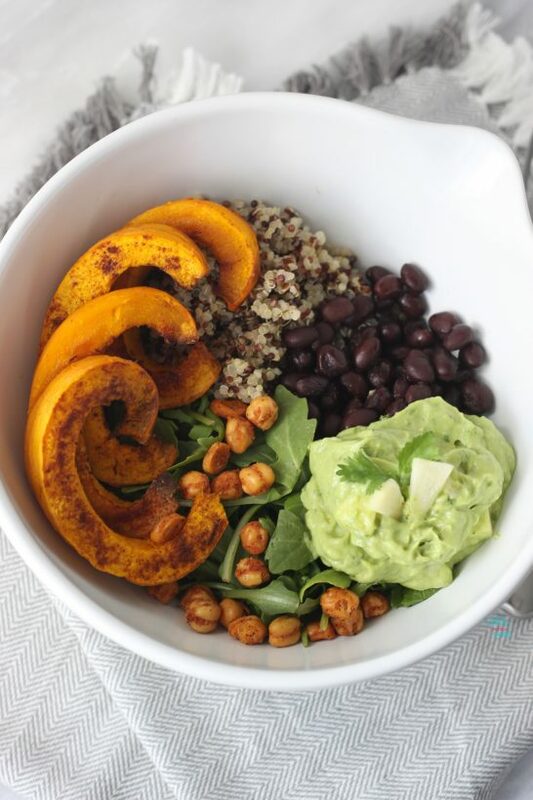 I love pumpkin flavor with anything, and I think it would be a great compliment to quinoa and black beans! Thank you! It’s so good and the apple guac puts it over the top! A bowl of perfection! YUM YUM! Thank you, it’s really good! I love it! You can swap it for butternut squash or sweet potatoes too. One of my favorite things is pumpkin chili! Pumpkin for a taco bowl?! This is SO clever and looks really really yummy! Yep! Thank you it really is! App,e Guacamole sounds so delicious! 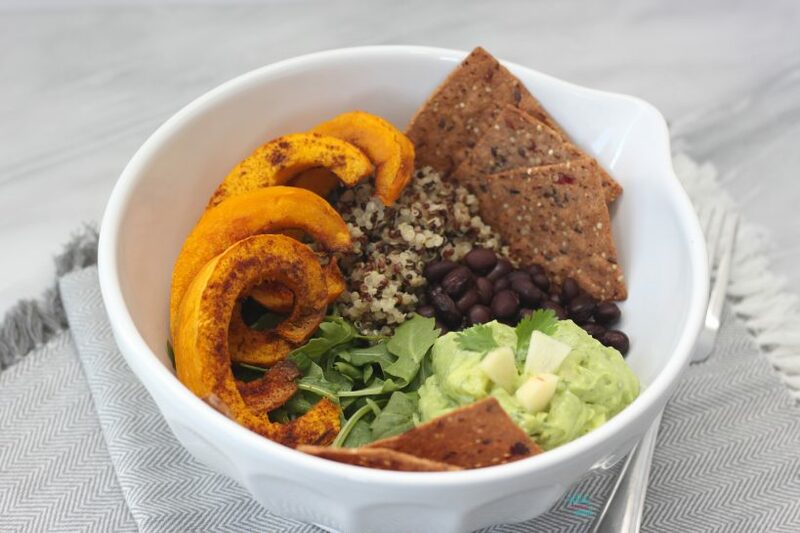 And this pumpkin taco bowl looks so easy! It’s really good and so easy, can’t go wrong! oooooh this looks great! I’ve got some leftover pumpkin for this! Oh let me know what you think if you make it! This sounds like a delicious savory and satisfying meal! i need to buy some pumpkin!! Def pinning this one!! And so festive for fall! Taco Tuesday is a must in my house, I love this fall recipe! YES! If you decide to change things up this is a great one! You had me at apple guacamole! Love all of these flavors! Oh it’s so good! It’s a delicious explosion of fall flavors! Super healthy taco tuesday recipe! Wonderful spices in this Sarah, and I’ve never thought to use pumpkin this way. Delicious! Thank you Alisa! It’s a delicious savory way to enjoy pumpkin! That guac sounds so cool! The guac is so good! I could eat it every day with the sprouted Pumpkin Cranberry Chips! I can eat food like this every day! So nutritious and delicious! This looks so delc, and THAT apple GUAC, wow!! The guac is pretty amazing! Thank you, hope you love it as much as I do! Thank you for pinning! i am loving all of these beautiful bowls of food everyone is doing lately. looks beautiful and sounds delicious! They are so easy and delicious! Mix it up, make it a salad, but I’m all about the delicious veggies and healthy toppings! This is like a fall twist on one of my staple dinners! I love this idea! Exactly why I made it a fall makeover on one of our favs! Thank you! Oh you need to pick up a sugar/pie pumpkin! I love them in savory dishes like this or pumpkin chili, breakfasts like oatmeal, puddings, the options are endless! Let me know what you make when you buy one! I would totally order this version! Too bad none of the mainstream places around here have this. It would make a great fall addition to their menu. Thank you! Maybe I need to get a food truck and drive it around the us! Haha! Yay for pumpkin and bowl recipes! Such a creative little bowl of goodness! Definitely going to try it. Thank you! Let me know what you think if you do. I never would have thought of pumpkin tacos, but I love pumpkin and I love tacos! Oh it’s so good, you have to try it! Apple guacamole?? That sounds awesome!! I love the way you described this for a restaurant menu – very apt description. I can picture it in my head, but your gorgeous pictures make it that much better. If I weren’t terribly sensitive to pumpkin, I would totally order this. I think I may recreate this with butternut squash. Oh yes, it’s so good! Especially with the Pumpkin Cranberry Sprouted Tortilla Chips! You can easily swap the pumpkin for butternut squash or sweet potatoes!